Oh, Denmark…Blondes, beer, football and Metal! Has anyone ever been thinking 'bout the fact that you really have to try hard to come up with a rather bad, horrific or disappointing band from that country? Think hard…It's just that many Danish bands are not known around the globe. Let's do some discography research 'bout what Denmark has supplied the universal Metal inventory with: From Pretty Maids to Artillery, from D.A.D. to Crystal Knight, from Evil to Force Of Evil, from King Diamond to Mercyful Fate, from Maltese Falcon to May-Linn, from Mnemic to Witchcross, from Zozer Mez to Royal Hunt (half Swedish, though), from Twilight to Invocator, from Narita to… Manticora! 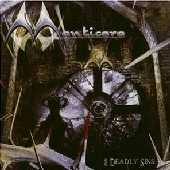 Manticora was formed in 1997 by Lars F. Larsen, Kristian Larsen and Mads Volf. Recording the self-financed Dead End Solution mini CD the same year, the band's now trademark sound - hard hitting Power Metal with both Epic and Thrash elements - made a well-respected impression on both Metal fans (European, mostly) and the Press. Greece's Black Lotus Records signed the band in 1998 and released Mandicora's debut album Roots Of Eternity one year later (1999). The media and the fans applauded again this effort and the follow-up Darkness With Tales To Tell was released in 2001, once again receiving great acclaim. The band's appearance in Sweden Rock Festival in 2002 gave even bigger positive impression to the headbanging audience, resulting in the fast release of Hyperion later that year, an epic concept album voted as their best effort-to-date. Yet, the best move was in June 2004, when the band announced it had signed to the German Massacre Records label in Europe - and Nightmare Records in the USA. So, by one of Europe's premier Metal labels 8 Deadly Sins is now being released, willing to push Manticora higher into the Metal stock exchange. The band seems to be in great shape, unveiling all its assets and presenting another conceptual disc about a man who, on his death bed, is reflecting on his past life and decisions (both right and wrong) that he made and the sins he committed. Supplied by the assistance of ex-Twilight keyboardist Finn Zierler, Manticora's Power Metal (similar to Blind Guardian's mid-90s efforts at some times) is enhanced by really shuffle dark melodies, not however forgetting their speed side. It's only a matter of the album's concept idea that the overall pace has a little bit been moved to a more mid-tempo philosophy. Yet, the guitar work is admirable, the rhythm section is as stiff as never before and Lars is completely in his role trying to pass the appropriate mood track by track. Partialy bringing in my mind bands like Evergrey, 90's Angeldust or Stigma IV, this top-quality release will surely not disappoint you, unless your most complex Power Metal lies between Hammerfall and Edguy. OK, Mandicora's climbing up the Danish Metal directory.